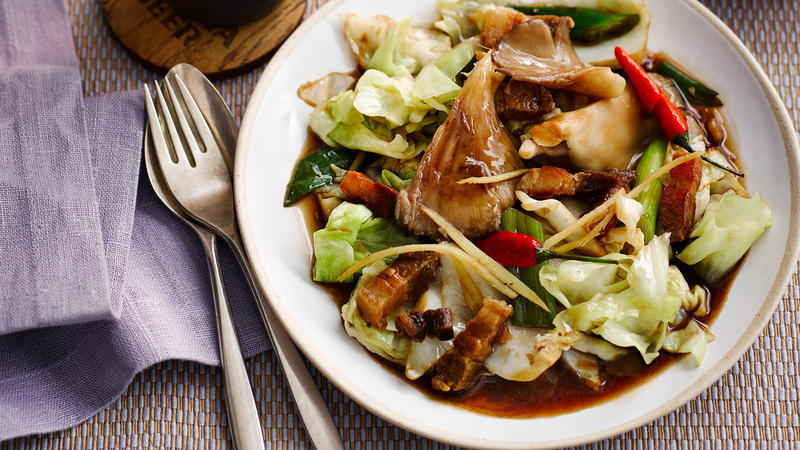 Andy Oliver puts a Thai spin on the sweet green cabbage with oyster mushrooms and crispy pork belly – and it's bound to be spicy, so it works well washed down with plenty of Singha beer. First prepare the pork: place a steamer pot with a generous amount of water in, on the stove, and bring to the boil. Sprinkle the pork belly with the fine salt, place in the steamer and cover with a lid Steam for 15-20 minutes until the pork is fully cooked and starting to soften slightly. Remove from the pot and allow to cool. Pat the pork belly dry with kitchen paper to remove excess moisture and then slice it across into 1cm thick slices. Now crisp up the pork by adding the 100ml of oil to a wok and placing on a medium heat. When the oil is hot add the pork slices and shallow fry, be careful as it will spit a bit (you can use a lid or splatter guard to avoid too much spitting in your direction). Fry the pork, stirring regularly until golden and crisp – about 4-5 minutes. Remove with a slotted spoon and set aside on kitchen paper to drain. Discard all but 2 tablespoons of the oil, and then return the wok to the heat, turn the heat to high and add the garlic, fry briefly until beginning to turn golden. Now quickly add the cabbage, bruised chillies, ginger, mushrooms and spring onions. Stir fry for a minute on a high heat before adding the stock or water, quickly followed by the seasoning (oyster and fish sauces, pepper and sugar). Keep the heat high and stir fry for 2-3 more minutes before adding your crispy pork. Toss this all together briefly to heat the pork through before tasting for seasoning (it may need a touch more fish sauce). somsaa.com. Follow Singha beer on Twitter and Facebook.